IN the next few weeks the State Government will make a decision which is likely to seal the fates of leadbeater’s possums and Victoria’s native forest timber industry. The possum, a cute critter and since 1968 Victoria’s faunal emblem, is in a bad way. No one is sure how many of them managed to survive the Black Saturday bushfires, which, according to official estimates, burned 45 per cent of the area kept for its protection and 34 per cent of its potential habitat. The State Government puts its numbers between 3750 and 11,250, which sounds dire, but is better than the earlier official estimate, which until its rediscovery in 1961 was zero. Unfortunately for the possum, it shares its habitat with another endangered species, the native forest timber industry. Again, relying on official estimates, VicForests, the government-owned entity which manages the logging of the state’s native forests, sources 70 per cent of its annual ash timber supply from within the range of the leadbeater’s possum. More importantly, some say this area is the most — indeed some would argue only — profitable part of VicForests’ logging activities. In other words, saving the possum is unlikely to be compatible with saving the native forest timber industry. Like the possum, the native forestry numbers have been in steep decline too. According to Australian Bureau of Agricultural and Resource Economics and Sciences data, in the decade to 2012, annual native sawlog production fell by 45 per cent and pulp wood — the stuff that ends up in the chipper — by 30 per cent. As for VicForests financial statements, the best that can be said for them is that they are not as bad as they used to be. According to its latest annual report, last year it took in $104.5 million from the sales of forest products, with other income taking its revenue to $106.3m. Alas, its expenses came to $105.3 million, meaning all up, its net profit was only $802,000 — which, while pretty dismal, is still better than the $96,000 it lost the year before. VicForests hasn’t paid a dividend to the Victorian Treasury, i.e. the taxpayers, since 2007. Indeed, it has only managed to pay a dividend twice since it was established in 2004. Across its eight years of existence it has reported an after-tax profit of only $12.3 million. But even that you can take with a grain of salt, as over the same period it has received government grants of $24.7 million. But as bad as these numbers are, the fact is they probably don’t reflect the true losses to the taxpayer of continuing to log native forests. For starters it doesn’t include the cost of fixing roads that logging trucks damage, nor the loss of water that disappears from dams and irrigation systems into regenerating forests after logging. Or more controversially, the cost of fighting the fires loggers sometimes start — something I predict we are likely to hear more about after this summer’s events. Getting back to the possums, Cabinet will soon consider a report from an advisory group which includes such possum-friendly folk as the boss of the Victorian Association of Forest Industries and representatives of VicForests, established to consider ways it can be saved “while maintaining a sustainable timber industry”. The report has gone to Environment Minister Ryan Smith and Agriculture Minister Peter Walsh. What it says, we’ll have to wait and see. Government sources say that the two men take a different view of what should be done. Smith is believed to support the creation of a Central Highlands National Park to save the possum, while Walsh is prepared to accept a small area be set aside to save the timber industry. His line of argument with his colleagues is expected to be that this is a jobs issue, which in an election year should trump other considerations. The Government claims the industry employs 2300 people, but it is unclear how many of those jobs depend entirely on native forestry, rather than a mixture of native and plantation timber. The largest employer, with 900 jobs, is the Maryvale paper plant, which has indicated in the past it would be happy to shift to chips from plantations. VicForests itself only employs 114 people. Normally, the smart money would be on “Walshie” to get his way. The Agriculture Minister has earned a reputation for winning internal battles. In a Smith vs. Walsh fight it would be no contest. The wildcard, though, is Treasurer Michael O’Brien and his department. O’Brien is unlikely to be impressed with an industry whose subsidies are retarding the growth of the private enterprise plantation industry. The possum may yet triumph over the loggers. It is extraordinary that Peter Walsh as a Victorian Minister stridently supports VicForests logging publicly owned scarce remaining native forests that shelter endangered species. Neither the Victorian Government nor its ministers should be in the logging business. When Peter Walsh attacks groups such as Environment East Gippsland (Heraldsun, 18/2/14) that take legal action when government-sanctioned logging breaks the law, he demonstrates a conflict of interest concerning the management of publicly owned forests. Taxpayers are then hit again paying for his legal settlement for his ill-considered and inappropriate comments. Walsh should resign or be sacked. When he is actively seeking to have 74,000ha of Tasmania's world heritage-listed forests delisted from UNESCO, how can Greg Hunt have the tile "Minister for the Environment"? To that I add his signing off on the Great Barrier Reef becoming a waste ground for mining sludge and a coal-ship super highway. The Abbott Government is targetting Tasmania's most bitterly contested forest flashpoint in its attempt to roll back World Heritage protection, for logging. A map of the target areas published by Federal Environment Minister, Greg Hunt, shows the Upper Florentine Valley in the island's centre would lose its World Heritage status under the plan he put to UNESCO on Friday. The bid, if successful, would axe 74,000 ha. 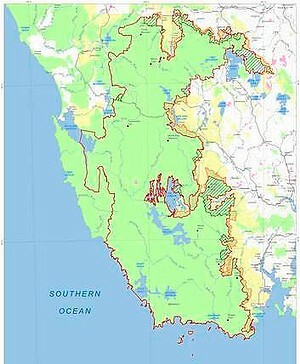 of the 120,000 ha of forest that was added to the Tasmanian Wilderness World Heritage Area in 2013, together with 50,000 ha of national park. Among a string of disputed native forest valleys running along the eastern boundary of the existing World Heritage Area, the Upper Florentine fight stood as the toughest. A five year blockade camp occupied the temperate rainforest and tall old growth eucalypt until 2011, and the valley was the scene of elaborate tree-sits, and dozens of arrests. In one of the most hair-raising events, a rampage by loggers wielding a sledgehammer and steel-capped boots on a blockade car occupied by protesters was secretly videoed, leading to three assault convictions. Teacher Miranda Gibson spent an epic 457 days in a tree-sit near the Upper Florentine to raise awareness of several forested valleys in the area, and campaign for their World Heritage listing. She only came down in March 2013 because of a nearby bushfire. The Federal parliamentary secretary for Forestry, Richard Colbeck, said the wilderness values of such areas, where logging had occurred, had diminished to the point that they no longer deserved World Heritage listing. But the 2013 extension was agreed by the World Heritage Committee on grounds other than wilderness, such as natural values of the trees themselves. The Wilderness Society's Tasmanian campaigns manager, Vica Bayley, said on Saturday that the attack on the Upper Florentine demonstrated the government's wind-back was all about opening confirmed World Heritage forest for logging. "The Upper Florentine is an incredibly intact and precious forest," Mr Bayley said. "And so are the other areas detailed on the map. The entire exercise is highly contentious, highly provocative - particularly when the forest industry doesn't want a bar of it." The Forest Industries Association of Tasmania confirmed that it stood firmly beside The Wilderness Society and other signatories to a 2013 forest peace deal in opposing any wind-back of World Heritage. FIAT executive director Terry Edwards said: "We've made our position quite clear. We don't support any or all excisions to the World Heritage Area. The 2013 extension was an integral part of our agreement." Mr Edwards said the industry was also concerned about the potential impacts the wind-back might have on Tasmanian forest products. "Wood that is supplied under the Tasmanian Forest Agreement is now non-contentious," he said. "We don't want to be put in the same position as in the past." We are at the dead end of a logging road deep in the Styx Valley of central Tasmania. In front is a stand of tall eucalypts. Beside us, the road verge swarms with their seedlings, self-sown in the few years since logging halted half a kilometre back, and already threatening to carpet the gravel entirely. It is a stunning blue-sky day in wild native forest. Delicate green and black Macleay's swallowtail butterflies float above. Biting march flies find us, too. We walk off the road's end into the shadows of the forest. Like silent marsupials, we pad over moss-soft ground, spacious and entirely weed-free, to look up the massive trunks of some of the bigger trees. This forest is ancient, the road is young - and for the past seven months all of it has been world heritage. It is what the former Labor federal environment minister Tony Burke called ''extraordinarily precious forest'' when UNESCO's World Heritage Committee approved the listing last June. And it is also what the current parliamentary secretary for forests Richard Colbeck says is wilderness so degraded that it makes him sick with anger at the scale of the deception. Australia's most contentious heritage boundary, as Burke called it, is being fought over again. The 170,000-hectare extension to the Tasmanian Wilderness World Heritage Area (WHA) was approved by the World Heritage Committee at its June 2013 meeting after decades of environmental campaigns. Now, the Abbott government is seeking a comprehensive wind back of the extension, removing 74,000 hectares, by the committee next June in Doha, Qatar. The move fans doubts about the federal government's overall approach to Australia's world heritage. It feeds an emboldened Liberal Party ahead of the Tasmanian state election. And it is said to threaten to reignite forest wars that split the island for a generation. Tasmanians call it the ''WHA'', as in ''Waa''. Its nucleus around the Franklin River in the south-west wilderness was first listed in 1982, and it grew by extensions to cover one-fifth of the island, or 1.4 million hectares, in 2012. The eastern boundary in tall old-growth forest was always disputed. Environmentalists believed this line was drawn along a contour chosen as the limit to commercial logging viability - not because of any end to world heritage values. Over time a network of logging roads was driven into the old growth-rich valleys running up to the boundary before the collapse of the native-timber woodchip industry. These roads and logging coupes were picketed by protesters, tree-sits slowed chainsaws, and confrontations sometimes blew into violence. Former Greens leader Bob Brown was shot at in 1986, and a dozen costly logging machines were firebombed and destroyed over the years, as were protesters' cars. The World Heritage Committee repeatedly asked Australia to address the question of the eastern boundary, including in 2008 when it said the WHA should be extended to ''include appropriate areas of tall eucalypt forest''. Eventually, the industry collapse led to marathon talks between business, union and green groups. Peace deals inked in April 2013 garnered $363 million in federal payouts to industry. They also included a signoff by all parties to the WHA extension. Endorsed by the Tasmanian Parliament, this extension went to the committee meeting in Phnom Penh last year, and, after a glitch over the Aboriginal archaeological component of the nomination, quickly passed. According to the committee, its outstanding universal values include its ''superlative natural phenomena, areas of exceptional natural beauty and aesthetic importance''. Specific values included giant trees, and tall eucalypts in connected forest. The Wilderness Society's Tasmanian campaign manager Vica Bayley, who went to Phnom Penh, said the committee was specifically told some areas had been logged, and were in the process of regeneration. ''To the best of our knowledge, it adds up to about 6 per cent,'' Bayley said. But they were included because they added to the integrity of the extension. ''Restoration of degraded areas in world heritage sites is normal,'' he said. Elsewhere in the WHA, small mines, quarries, airstrips and a host of other human uses are being rehabilitated. Like the eucalypt seedlings on the Styx road, nature is taking its course. Liberal candidates who scooped up three of the five Tasmanian House of Representatives seats campaigned on the wind back. Last week, Environment Minister Greg Hunt confirmed the process was under way, saying the government was critical of ''the content of much of [the 2013 extension]'' and would lodge a new claim for a boundary adjustment by the deadline of Saturday, February 1. The wind back campaign is being led by Tasmanian senator Colbeck, who is parliamentary secretary to Agriculture Minister Barnaby Joyce. A one-time carpenter, Colbeck said his own scrutiny of the extension showed ''tens of thousands of hectares'' had been previously logged. He rejects the statement of support for the 2013 extension by the Forest Industries Association of Tasmania and other industry groups. ''The forest is not the forest industry's to give away,'' he said. Instead, Colbeck points to the government's specific election commitment, and the emphatic success of Liberal candidates in Tasmania. In a polling booth such as the downturn-hit timber town of Triabunna, there was a 27 per cent swing to Liberal candidate Eric Hutchinson. Approaching the March 15 state election, the front-running Liberals unofficially launched their campaign by releasing a policy to ''crack down on forest protest'', with $10,000 fines for first-time protesters who impede access to a workplace, and a mandatory three months' jail for a second offence. It is this possibility that appals federal opposition environment spokesman Mark Butler. There is also a wider national question. Would a successful wind back of the Tasmanian extension embolden a government to seek changes to inconvenient boundaries of other world heritage properties, such as on the Great Barrier Reef or Kakadu? ''I would reject that,'' Colbeck said. But Butler said he was increasingly concerned at the potential links. Already, the Great Barrier Reef is threatened with a World Heritage in Danger listing, and the government had stalled a Cape York nomination.